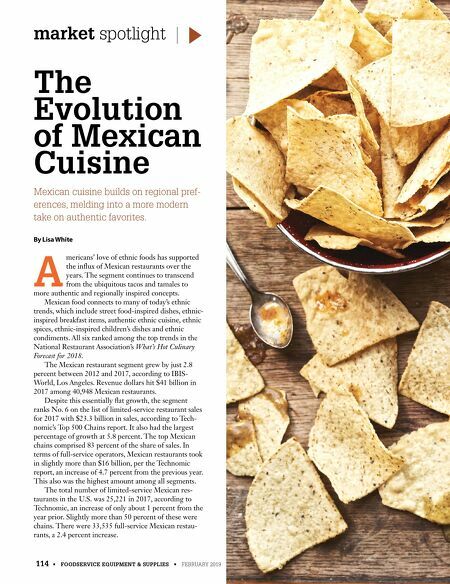 114 • FOODSERVICE EQUIPMENT & SUPPLIES • FEBRUARY 2019 The Evolution of Mexican Cuisine market spotlight Mexican cuisine builds on regional pref- erences, melding into a more modern take on authentic favorites. By Lisa White A mericans' love of ethnic foods has supported the influx of Mexican restaurants over the years. The segment continues to transcend from the ubiquitous tacos and tamales to more authentic and regionally inspired concepts. Mexican food connects to many of today's ethnic trends, which include street food-inspired dishes, ethnic- inspired breakfast items, authentic ethnic cuisine, ethnic spices, ethnic-inspired children's dishes and ethnic condiments. All six ranked among the top trends in the National Restaurant Association's What's Hot Culinary Forecast for 2018. The Mexican restaurant segment grew by just 2.8 percent between 2012 and 2017, according to IBIS- World, Los Angeles. Revenue dollars hit $41 billion in 2017 among 40,948 Mexican restaurants. Despite this essentially flat growth, the segment ranks No. 6 on the list of limited-service restaurant sales for 2017 with $23.3 billion in sales, according to Tech- nomic's Top 500 Chains report. It also had the largest percentage of growth at 5.8 percent. 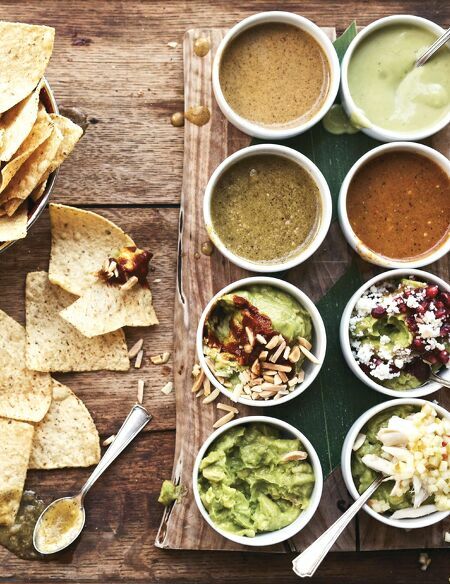 The top Mexican chains comprised 83 percent of the share of sales. In terms of full-service operators, Mexican restaurants took in slightly more than $16 billion, per the Technomic report, an increase of 4.7 percent from the previous year. This also was the highest amount among all segments. The total number of limited-service Mexican res- taurants in the U.S. was 25,221 in 2017, according to Technomic, an increase of only about 1 percent from the year prior. Slightly more than 50 percent of these were chains. There were 33,535 full-service Mexican restau- rants, a 2.4 percent increase.